What is a California Non-Disclosure Agreement? California Non-Disclosure Agreement: What Is It? A California non-disclosure agreement is abbreviated as NDA. You may also see it listed as a Confidentiality Agreement. A California non-disclosure agreement is a legal document where the employee or the contractor promises not to reveal certain business secrets. A California non-disclosure agreement should only be used in the interest of protecting legitimate business secrets. A California non-disclosure agreement is a legally binding contract that is governed by the State of California. Since it is designed to protect trade secrets belonging to a business, it’s important that you understand what a trade secret is as well as understand the basics of what California law says about the document. The definition of a “trade secret” for a business is found in CA Civ Code §3426.1. This is the Uniform Trade Secrets Act. A “trade secret” is defined, in part, as “information, including a formula, pattern, compilation, program, device, technique, or process, that…” provides the business with an independent economic value that is either actual or potential and it isn’t known to the general public. Additionally, the business must make reasonable efforts to keep that information secret. California non-disclosure agreements are governed by CA Civ Code §3426 in regards to trade secrets as well as the California Business and Professions Code §1660. The California Business and Professions code states that “every contract by which anyone is restrained from engaging in a lawful profession, trade, or business of any kind is to that extent void.” However, the California Supreme Court held that NDAs may be used in employment contracts if the NDA is necessary to protect trade secrets. Muggill v. Rueben H. Donnelley Corp., 62 Cal.2d 239, 242 (1965). Remember that a California non-disclosure agreement may only be used to protect trade secrets. 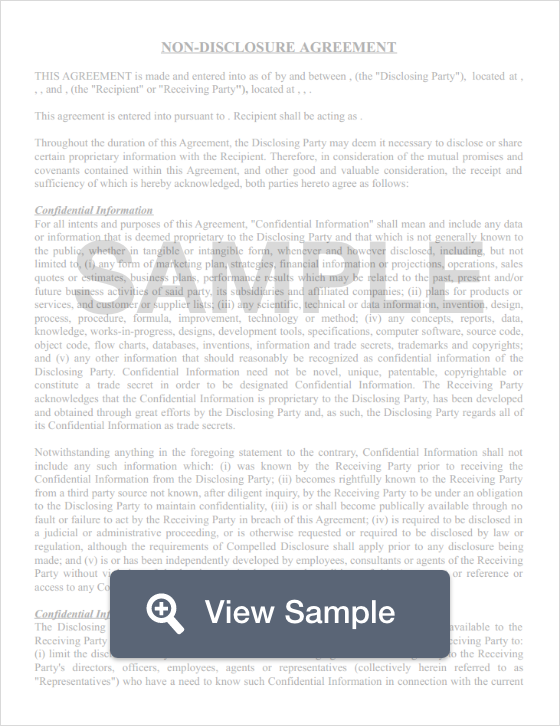 Non-disclosure agreements are often used along with a non-compete agreement. However, California courts will not uphold either document if they are viewed by court as overly restrictive.